Billy Champion. That name represented the closest the 1969 Phillies would even get to being a champion. You see, Champion, a pitcher, was supposed to be one of the fantastic young talents that would carry the Philllies into major league history. Instead he was in the middle of a historically bad stretch which covered a generation from the 1950 Whiz Kids, who were swept by the New York Yankees in that year’s World Series, through the devastating 1964 collapse, up until the team’s playoff appearances in the mid-70s. That was 25 years. For those of us who lived through that era, well, we cherish the success of the Phils knowing what the other side felt like. 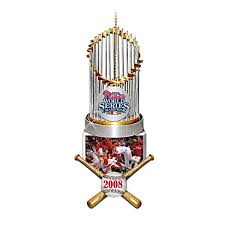 I have an ornament showing the Phillies 2008 World Series win. It is heavy. So heavy that you really can’t hang it on a tree — it will bring the branch down and maybe even break it. You need to have it under the tree, or in a special place where it can be appreciated and viewed. After all, these championships come once in a generation. First one in 1980. Second one in 2008. The franchise has been around since the 1800s! I’ve come full circle – loving baseball as a kid, playing all the time (including stickball, fastball and half ball.) Then shifting to hockey and football as sports to follow intensely. Now, as I get older, I am back to baseball again. I enjoy going to a game. Relaxing. Watching. Taking it easy. No crazy tailgating or face painting. Just enjoying a beer and a game. It was really the opening of Veteran’s Stadium that gave me my first real pleasure of baseball. It was right there in South Philly and I could walk to the game. And don’t let anyone tell you stories about “sneaking in” to the Vet to watch games. Everybody got into the Vet. For free. We all knew somebody. Joe selling papers outside. John at the gate to let you in. Maria the usherette finding you a good seat. Somebody’s dad selling sodas. Somebody’s mom working a concession stand. Friends on the ground crew. It was perfect. Warm summer night. Hanging out. Harry and Whitey on the radio. Someone says, “Let’s go to the game.” So we went. We learned to love those teams because they were ours. We ha d a nice run starting in the mid 1970s through the mid 1980s, but then tailed off again. Except for the 1993 lightning in a bottle (or maybe it was HGH in a syringe) when “Macho Row” when to the World Series, we continued to live in the baseball wasteland. Those last few years at the Vet were terrible. No one at the games (everybody gets a foul ball), Chad Ogea pitching every time we had tickets. The Vet was crumbling. Walking around the empty corridors, you could hear the echo of your voice even if you were speaking to the person next you. The only entertainment came from the fans that latched on to players (mostly pitchers) and formed mini fan clubs primarily for their own amusement. Remember “The Wolf Pack” for Randy Wolf? How about “Padilla Flotilla” for Vincente Padilla, a politically incorrect group that had sombreros and kayak paddles as if they were paddling across the Rio Grande. One of my all-time favorites was the self-identified “Generic Fan” who sat in the upper deck, all alone, wearing a white pants, white sneakers, white hat and a white shirt with a bar code on it. As Phillies fans, we are anything but generic. We have passion, we have knowledge and we know bad baseball when we see it. I think it is our genetic baseball history. That feeling of joined misery that keeps us Phillies fans going. That euphoria when they finally won in 1980 and then – a generation later – in 2008. They are our team. And I can’t wait to go the games this year. Among the many charities and good works in the community, the Phillies organization holds an annual “Strike Out ALS” festival. Visit www.phillies.com for more information or visit www.als.org to learn more about the disease and how you can help.